It’s a beautiful day in the . . . whaaaaat?!? – Grammargeddon! It’s a beautiful day in the . . . whaaaaat?!? If you can’t read it, the phrase says the opponent “has allowed crime to go up over 50% in our negrohood.” Yow. That’s some inadvertent error, all right. You really have to go out of your way to misspell “neighborhood” as “negrohood.” Most typos aren’t quite so . . . different from the original word. 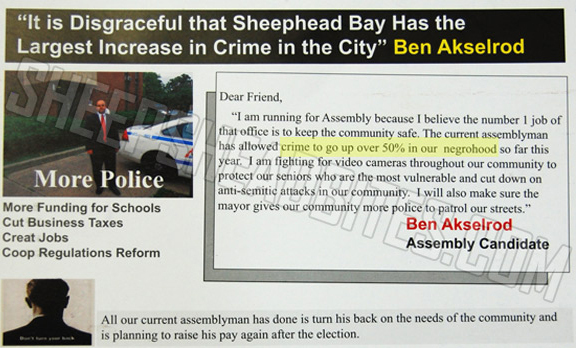 But even if we give Akselrod’s campaign the benefit of the doubt and assume that the word truly was an unintentional typo rather than a Freudian slip, the mailer still makes him look pretty bad. It contains several other spelling and grammatical errors. For example, we learn of Akselrod’s desire to “Creat” jobs and the fact that he misspelled the very name of the district he wants to represent! Heck, even his name seems like a typo—I mean, is it just me, or do you want to mark up your monitor to change the spelling to “Axelrod”? Clearly, the text wasn’t even run through a spellchecker, much less proofed by human eyes. Regular readers of GRAMMARGEDDON! will remember that we recently saw another creative misspelling of “neighborhood” on a Boston public school sign. Maybe there’s something in the water on the east coast. Time travel? I doubt it.